Help reduce the pressure on your lower back and tailbone while sitting for extended periods, especially on hard chairs. This DMI. Sloping Seat Cushion will not only give you comfort and support, but will help align your spine in the proper position. The three-inch opening provides relief for the coccyx area while the sloping angle positions your body correctly to avoid slouching. 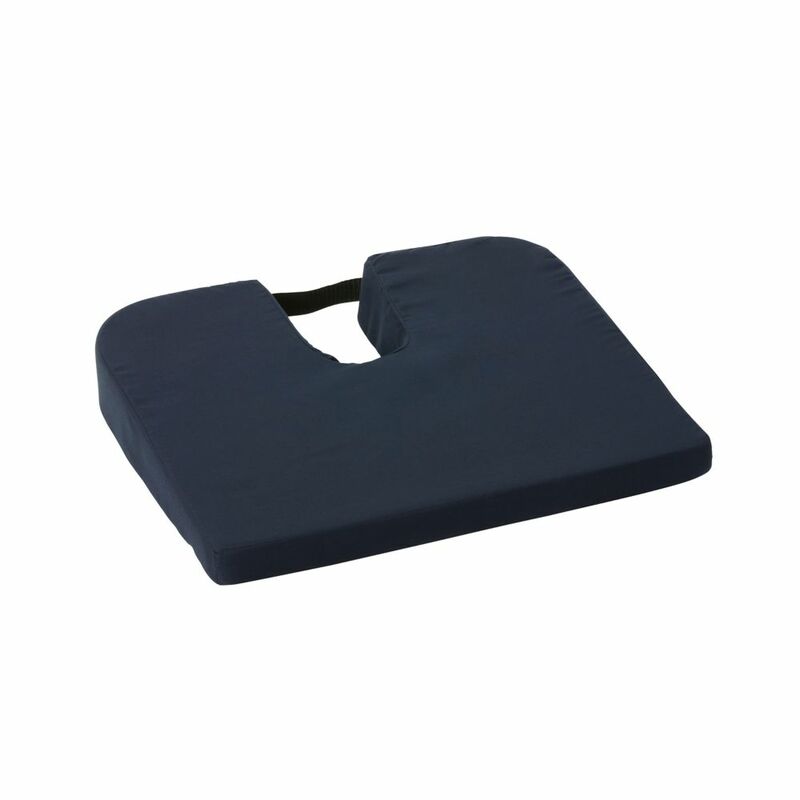 This coccyx support cushion is great for use on office chairs, at home, in your car or while traveling. It's also ideal to take to special events to cushion yourself on hard stadium seats. It comes with a machine washable cover and built in carry handle. To ensure the best posture, the best angle for any seat is titled slightly forward. Most chairs do the opposite. The back is lower than the front which causes slouching! This cushion can help correct that by allowing your knees to drop lower than your hips. This helps align your back in the right position to sit upright, helping you to have better posture. Plush and cozy faux fur cushion comes in assorted colours of White, Grey, Navy and Blush. Filled with 100% recycled water bottle fibrefill. Spot clean only. Give your bistro chairs an inviting and refreshed look with this bistro seat cushion from Hampton Bay. Designed in a colourful and elegant pattern, this cushion is ultra-comfortable with a superior polyfill and durable with outdoor polyester fabric that is UV treated to resist fading. Featuring a tufted look for added comfort and style! 18 inch Foam Seat Coccyx Cushion Help reduce the pressure on your lower back and tailbone while sitting for extended periods, especially on hard chairs. This DMI. Sloping Seat Cushion will not only give you comfort and support, but will help align your spine in the proper position. The three-inch opening provides relief for the coccyx area while the sloping angle positions your body correctly to avoid slouching. This coccyx support cushion is great for use on office chairs, at home, in your car or while traveling. It's also ideal to take to special events to cushion yourself on hard stadium seats. It comes with a machine washable cover and built in carry handle. To ensure the best posture, the best angle for any seat is titled slightly forward. Most chairs do the opposite. The back is lower than the front which causes slouching! This cushion can help correct that by allowing your knees to drop lower than your hips. This helps align your back in the right position to sit upright, helping you to have better posture.